In this day and age, all parents can benefit from the following knowledge, understanding and insights to help ensure the health, wealth and full development of your child’s life. No generation of children in history have ever faced or were exposed to so many environmental stressors, obstacles, toxins or hazardous materials from both the environment, speed of life, and the typical dietary foods of today. The mind, body and immune system that is developed and grown in childhood, becomes, and will be the foundation, the springboard, for everything that follows in each child’s life. Shaping, creating and influencing every aspect, potential and outcome that will be experienced throughout their life. The success, mediocrity or failures that each of us experience in life is sown in the seeds of our childhood. The full responsibility of this time and part of life, childhood, should be and is placed directly and firmly on you, the parent, the conceiver and caretaker. Diet, nutrition, environmental pollutants from this century’s industrial pursuits, such as metals, (lead, mercury, arsenic, etc. ), chemicals, plastics, pesticides, artificial food additives, etc. entering into the food, air, and water, are all affecting and shaping each child’s mind, body and immune system, whether we care to acknowledge, or understand, or intervene, or not. Today’s over-stimulatory society, with overwhelming levels of childhood exposure to TV, video games, electronics, sights, sounds and perceptions are all affecting and influencing your child’s nervous system, brain development and function. What forces are shaping and impacting the health of your child today? What is the role that diet and nutritional supplementation is responsible for, in helping to maintain and improve your child’s health? Diet, food, supplementing with vitamins, minerals, anti-oxidants, detoxification, essential fatty acids … these may all provide beneficial qualities to the physical, emotional and mental health of your child. 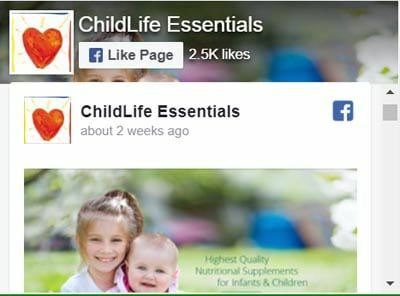 In this post, we will take a look at the ingredients, function and purpose of some ChildLife® products to better understand the place that nutritional supplementation can have in supporting your child’s health and development. “Eat Right and Take a Multivitamin.” This was the title and advice reported in the New England Journal of Medicine, from a 1998 study examining the influences that food and vitamin supplements hold in determining our state of health and vitality. This is particularly sage advice for children who require these vitamins and minerals, the very building blocks of life, for their health, but also for their full growth and development. catalysts and co-factors for energy production and metabolism. Studies continue to show that typical children even with a relatively healthy diet, are able to improve reading speed, learning capacity, and mathematical skills, by daily supplementation with a good MultiVitamin/Mineral. (Wang,Y. Effect of micronutrient supplementation on health status of children. Wei Sheng Yan Jiu, 2003, Sep, 32(5), 455-8). Daily supplementation was also shown to be beneficial in promoting growth and increasing immune strength in school children. (Sarma, K., Effect of micronutrient supplementation on health status of schoolchildren. J. Nutrition, 2006, Jan., 22, 8-14). Eat Right and Take a MultiVitamin. This is good advice for us all, but particularly pertinent to children. 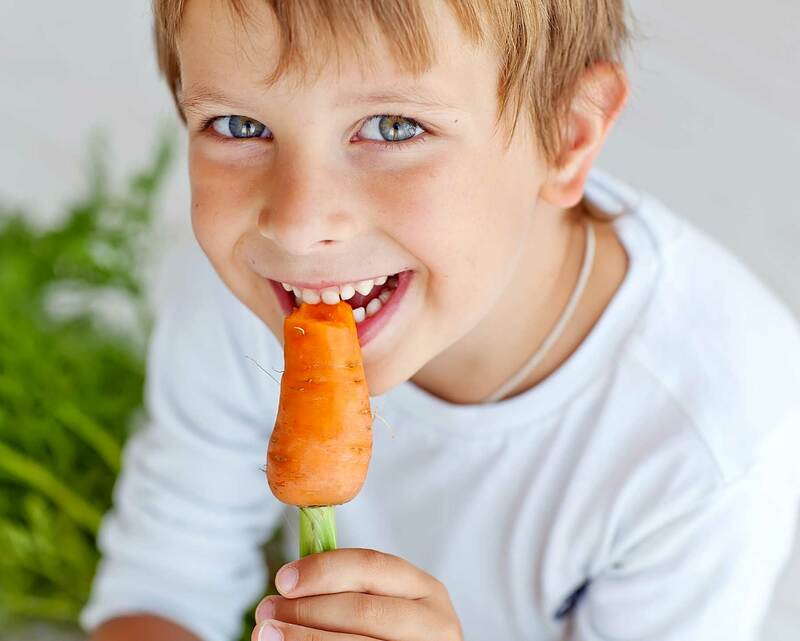 Provide your child with a healthy diet consisting of organic fruits and vegetables, organic poultry, organic meats and wild caught fish (avoid farmed fish). Avoid added chemical flavorings and chemical colorings. Reduce sugars, avoid or severely restrict any fast-foods. Offer your child the foods that suit their own individual blood type best. 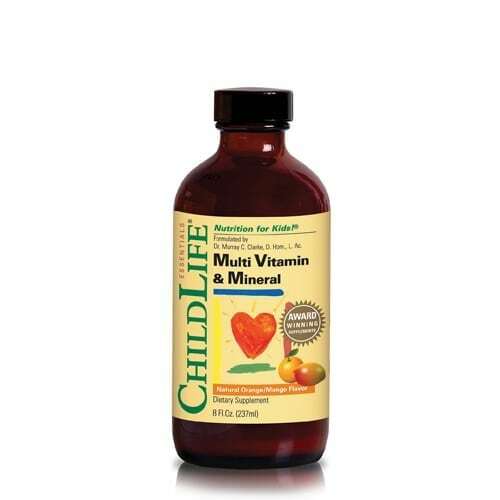 Then supplement with the ChildLife® Multi Vitamin & Mineral formula. The vitamins and minerals establish a stable nutritional platform for your child to stand on. From this foundation, their growth, development and immune strength may continue to progress to their full potential. Along with a daily Multi Vitamin/Mineral, all parents should consider daily supplementation with the essential Omega 3 fatty acids. These are found in vegetable sources like flax seeds, pumpkin seeds and olive oil, or from the sea in the form of cod liver oil. With all the current research and studies showing how and why the Omega-3 oils are so important for so many functions within a growing child’s brain and immune system, it is no mystery now why so many cultures and countries have a long and rich history of parents giving their children cod liver oil. 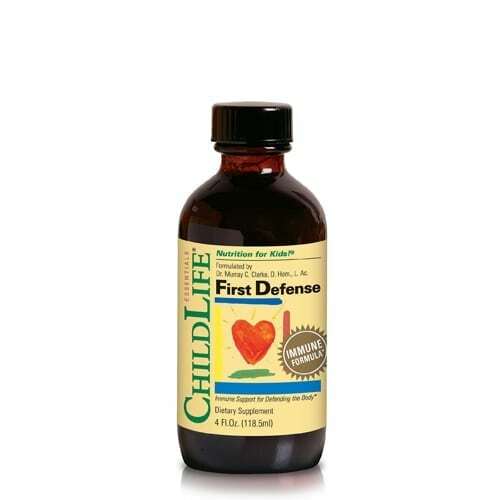 The choice between giving your child the vegetable-based ChildLife® Essential Fatty Acids formula or ChildLife® Cod Liver Oil is a personal one, with some advantages leaning towards the Cod Liver Oil. One of the primary nutrients derived from these oils is DHA, docosahexaenoic acid. The difference between these two products is that your child’s body needs to take the vegetable-based Omega-3 oil and convert, or make, a percentage of that into DHA. Whereas in cod liver oil, the DHA is already present and ready for use. Cod liver oil contains the highest naturally occurring amount of DHA from any food source along with Vitamin A, which combine to provide the two primary nutrients for both brain and eye development. Other considerations when choosing to use cod liver oil is the absolute freshness and purity of the oil. 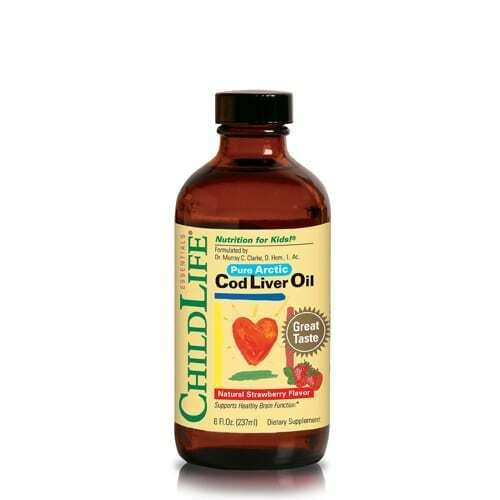 At ChildLife® we always use the highest grade of cod liver oil available with third party testing to confirm that our oils are purified and free from any detectable mercury, lead, dioxins or PCB’s. 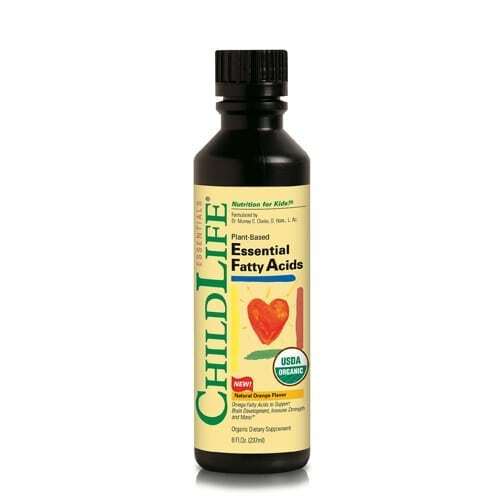 The Omega-3 fatty acids from ChildLife® Cod Liver Oil or the vegetarian ChildLife® Essential Fatty Acids formula are recommended to be given on a daily basis along with the ChildLife® Multi Vitamin & Mineral. As noted above, DHA is the primary nutrient involved in brain function and growth. Sixty percent of the brain grows from, develops from and is comprised of fats and oils. (Schmidt M. “Smart Fats, How dietary fats affect mental, physical and emotional intelligence.” N Atlantic Books 97). Fifty percent of these fats is the one fatty acid DHA. This makes DHA the most prevalent nutrient in the brain and therefore the most important. The highest concentrations of DHA in the brain are found right in the middle, in the central part of each individual brain cell, where it is used to provide insulation and facilitate the smooth flow of electrical impulses which are carrying and delivering information between the 100 billion brain cells inside our heads. 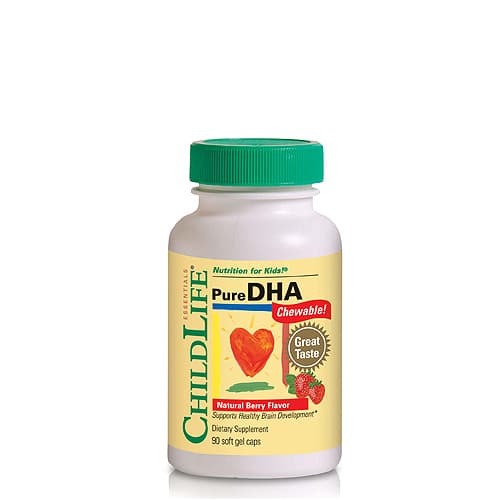 This specific function of helping brain cells deliver information smoothly, effectively and without interruption is why DHA has been noted to be helpful in supporting and enhancing focus, learning, memory and mood. Our ChildLife® Pure DHA is derived from Cod Liver Oil, again from the highest quality oil which is purified then tested to be free of any detectable amounts of mercury, lead, dioxins or PCB’s. In the soft-gel chewable form, we have found that this provides an alternative to the liquid Cod Liver Oil for infants and children to receive this all important nutrient. Some children prefer the taste and texture of the flavored, chewable capsules to the flavored liquid Cod Liver Oil. You do not need to give a child both products. Just see which one they prefer. Supplementation with Pure DHA or Cod Liver Oil is recommended when your infant begins to eat solid foods. Vitamin C is the number one superstar of all the essential vitamins. 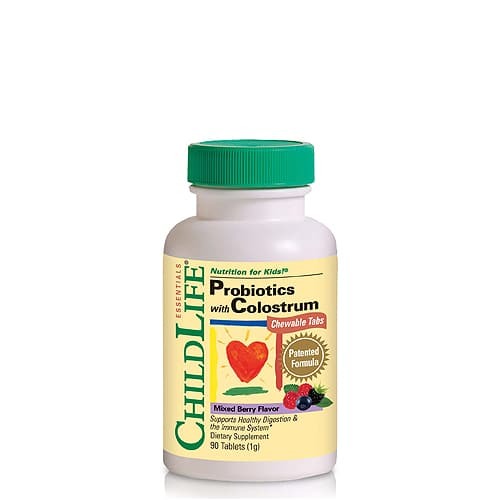 Since Linus Pauling (two time Nobel laureate) began researching, understanding and recommending Vitamin C in the 1950’s, this vitamin continues to demonstrate why it is so important for maintaining and promoting good health and immune vitality. As the primary anti-oxidant vitamin, Vitamin C has become increasingly important as the amount of environmental toxicity and pollution that we are all exposed to continues to increase throughout the world. Every and any child growing up in or near a city in today’s world will inevitably be exposed to higher amounts of pollutants and external toxicity, than any previous generation. In one of the most recent studies to document the extraordinary exposure and accumulation of pollutants and toxins in children today, the umbilical chord blood of babies from around the United States was tested for toxins at the time of their birth. Researchers found an average of 200 industrial chemicals and pollutants in the umbilical cord blood of each baby. A total of 287 different chemicals was found in the group. Of the 287 chemicals detected, over 200 are known to be toxic to the brain, over 100 are known carcinogens and 208 can cause abnormal development. (Body Burden, The Pollution in Newborns, A benchmark investigation of industrial chemicals, pollutants and pesticides in umbilical chord blood. Environmental Working Group, July 2005). To combat the negative effects of these pollutants, the body’s first line of defense requires extra antioxidants. These antioxidants are used to neutralize toxins and then help the body detoxify and eliminate them safely. Vitamin C is the main vitamin for children to use as an antioxidant. 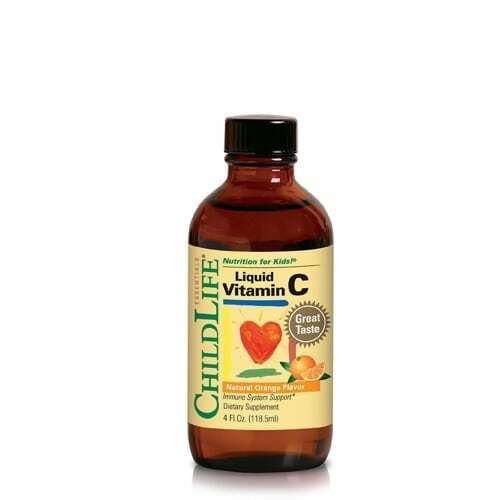 Vitamin C has never been more important or required for children to take on an ongoing basis. 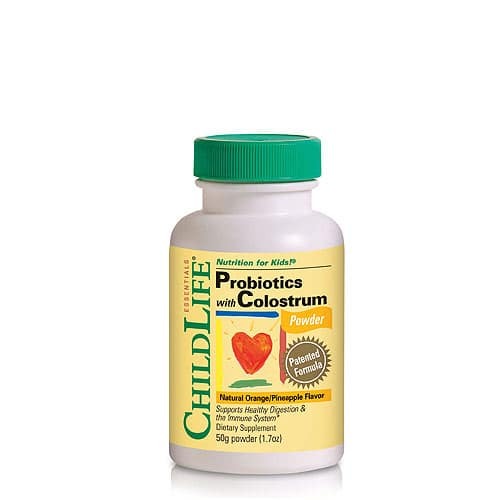 This is a unique ChildLife® formula combining the outstanding immune properties of Colostrum with the digestive and immune functions of the probiotics, as well as including the pre-biotics. Colostrum: Pure Colostrum, from naturally-raised cows, antibiotic-free, hormone- and steroid-free, strengthens immune regulation and response and provides digestive support. Prebiotics: F.O.S, (fructo-oligo-saccharides) and Rice tocotrienols are prebiotics that support the efficacy of the probiotics and assist in maintaining a healthy digestive system. As children grow, bone development is one of the most visible and active parts of their bodies increasing stature and size. Calcium is the most abundant mineral in the body, making up 1.5- 2% of total body weight. Around 99% of the calcium in the body is found in the bones. The rest is in the teeth, soft tissues and blood. All of the minerals, like the vitamins, work in concert with each other and some have particular partners that are required to maintain proper balance, metabolism and absorption. Calcium’s primary partner is Magnesium and it is recommended that these two minerals are always taken together. Along with Magnesium, Zinc has also been noted to assist in the absorption and utilization of Calcium. For growing strong and healthy bones, Calcium, Magnesium, Zinc and Vitamin D are the primary nutrients that are required. The form that each mineral is in will also determine how easily and readily that mineral can be absorbed and utilized by the child’s body. For most minerals, the “chelated” form is the preferred form. 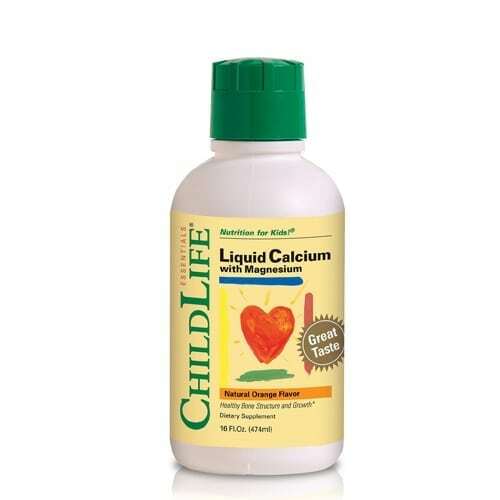 In the ChildLife® Liquid Calcium with Magnesium formula we use Calcium Citrate, Magnesium Citrate, Zinc Citrate and Vitamin D. All of the minerals in their “chelated“, citrate form along with Vitamin D to provide the nutrients that are involved in supporting healthy bone growth and development. Supplementing with this formula can be considered if your child has a restricted diet, not a very well balanced diet or does not tolerate dairy products well. Ensuring your child is receiving their daily requirement of Calcium is an important part of their growth and maturation. A part of growing up for all infants and children is being exposed to new and wider environments at each stage of growth. As this process takes place each child’s immune system comes into more contact with many and varied challenges. This is a part of how the immune system develops and grows stronger, by confronting these challenges and learning how to overcome and defend against each new situation. From a natural point of view, we want to assist the immune system in this process of learning how to defend and protect the body. At different times and seasons of the year, children are more likely to be exposed and require the use of this formula. Together these herbs and nutrients provide a very complete and effective formula for protecting and defending the body. Use when needed and periodically for extra immune support and protection. This formula is designed to provide seasonal support for children. It is an all-natural formula with phytonutrients to help regulate hyper-immune response, antioxidants to reduce environmental irritation and herbs to support the immune system. The herbal extracts of Elderberry (sambucus nigra) and Amla (emblica officinalis) found in this formula are designed to work synergistically in helping the immune sytem to regulate itself and respond appropriately. The phytonutrients found in Grape Seed extract (Proanthacyanadins) and Bromelain have been noted to assist the immune system particularly in relation to seasonal challenges. Zinc gluconate is the primary mineral antioxidant for reducing environmental irritation and supporting the immune system. Vitamin C, as we have discussed, is the primary vitamin antioxidant for reducing environmental irritation and supporting the immune system. In liquid form, this formula is readily absorbed and easy to use for children of all ages. This formula can be given daily on an ongoing basis if required, or periodically as needed. The ultimate purpose and goal for our company and product line is to provide you, the parent, with the highest quality nutritional supplements available. Specifically designed and manufactured for infants and children and based on my 20 years of experience as a homeopathic pediatrician. They only include the nutrients, essential vitamins, minerals, oils and herbs that I have observed to be the most important and the most effective. I trust that this information and our formulas may assist and be helpful for you and your child’s life.